Were delighted that Ericsson has been listed in Ireland’s top Graduate Employer List. The list reveals Ireland’s most sought-after employers from the perspective of those that matter most – the students and graduates who will provide the next generation of innovators and leaders in Irish business. The Ireland’s 100 leading graduate employers survey is part of the European Student Barometer and is conducted by Europe’s leading graduate research firm, trendence. The data produced decide the winners of Ireland’s 100 and the winners of the gradireland Graduate Recruitment Awards and contribute also to a wider pan-European study across 24 countries. Great to see the attendance at the GradIreland recruitment fair in the RDS Dublin. 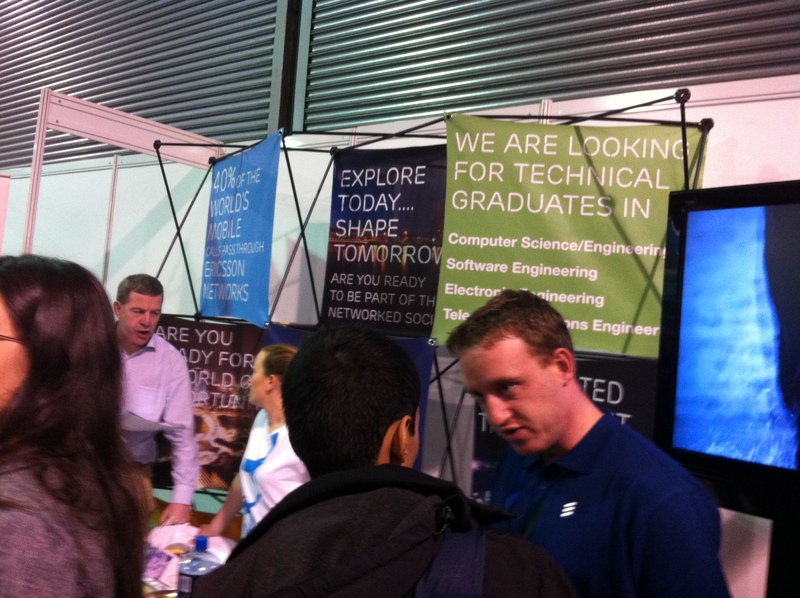 There was lots of interest at the Ericsson stand, especially when we mentioned the great graduate role we have open in Dublin at the moment (more detail here: https://6arry.wordpress.com/2013/10/01/ericsson-ireland-graduate-opportunities-2014/) and visitors to the stand got to meet some of the Engineers from the business.